The upcoming holiday season can be a time of joy, with family, friends and celebration. The holiday season can also be a time of stress, with tangled lights to untangle and hang, gifts to shop for and wrap, and parties to plan. That stress can be magnified if you are involved in a 1031 Exchange that might not be going well. Perhaps you were able to sell your relinquished property during 2017 as you had planned, but maybe the like-kind property you found to replace your just-sold one fell out of escrow. Or maybe the seller of your replacement property decided to push the closing date into early 2018. Or maybe you got caught up in holiday festivities and missed your 45-day identification period due date. As a result, you could be stressed because you were unable to close on that replacement property by the end of 2017. You may be further stressed when you recognize that your 180-day timeframe may not actually be the full 180 days. Under IRS 1031 exchange regulations, taxpayers have 180 days from the date of sale of their relinquished property OR until the date of tax return filing, whichever is sooner. With the looming prospect of paying capital gain taxes on the proceeds of the property you recently relinquished, the holidays may not be seeming so happy. Cheer up, there is some good news. First, exchange investors may still have their full 180-day exchange period available to them simply by filing a tax filing extension. Second, while it’s true that had the exchange taken place earlier in 2017 you would have been on the hook for those taxes if you’d been unable to close on your like-kind asset within the 180-day time frame set by the IRS, however, if your 1031 Exchange activity began in August 2017 or later and things collapsed or were delayed, you could defer those taxes into 2018, payable in 2019. With the above definition in mind, think about the 1031 Exchange process. You engage the services of a qualified intermediary (QI). When you relinquish your property, you have 45 days to identify potential replacement like-kind assets. The QI holds on to the proceeds of your sale. You find your replacement property, and close on it within 180 days following the sale of your relinquished asset. The QI uses the money obtained from the sale of your relinquished property to acquire the replacement property. So how does installment sale treatment fit into this? If you failed to identify potential replacement properties within your 45-day identification period, you exchange is considered to be “failed”. With no properties identified, there are no potential replacement property prospects and thus your QI may release your exchange proceeds to you as soon as the first day following the expiration of the identification period (day 46). Assuming calendar year tax reporting, if your relinquished property sold between November 16th and December 31st, then the end of your ID period will fall in a new tax year and thus your sale takes place in one tax year, but return of your proceeds due to a failed exchange takes place in a different tax year. Under this scenario, utilizing the IRC 453 installment sale rules, taxpayers have their choice to report their gain in either the year of the sale or in the year in which your proceeds are received. However, if you identify a potential replacement asset, and that asset’s acquisition doesn’t take place or is delayed, your QI isn’t going to immediately hand over the proceeds from your relinquished property. Rather, the QI will likely hold on to the funds until the 180-day period has passed (some exceptions are possible). So, if you sell your property in the latter part of 2017 with the intent to exchange it, that 180-day period won’t be up until 2018. Because you don’t actually receive the proceeds until 2018, meaning you can hold off on reporting the gains on that sale until you file your 2018 tax return – in 2019. The same is true for remaining proceeds from a partial exchange where replacement property was acquired, but less than 100% of the exchange proceeds were used, resulting in a balance being disbursed to the taxpayer. When choosing how and when to report your taxes in a straddle, there are a few key IRS conditions to keep in mind. The first major aspect of a successful installment sale is “intent.” You have to prove to the IRS that the exchange was not initiated simply to delay the tax liabilities from one year to the next. You need to demonstrate that, based on your knowledge, facts and circumstances at the beginning of the exchange, that you would find, and close on, a replacement like-kind asset before the end of the 180-day exchange period. The best proof of intent is a signed contract between yourself and the seller of the replacement property – even if the closing didn’t take place in 2017 - or at all. If you didn’t place a property under contract, you’ll want to document other activity to demonstrate your intent. Examples may include offers made or correspondence with sellers and/or brokers. The second consideration is if there was a mortgage payoff on the relinquished property. If a mortgage was extinguished at closing of the relinquished property, the portion of an investor’s gain from debt relief is not eligible for installment treatment and must be recognized in the year of the sale. Finally, for investors with large gains (generally greater than $5,000,000), there may be interest incurred on the amount of the tax liability which is delayed to the following year. Investors potentially in this situation are encouraged to consult with their tax advisor. 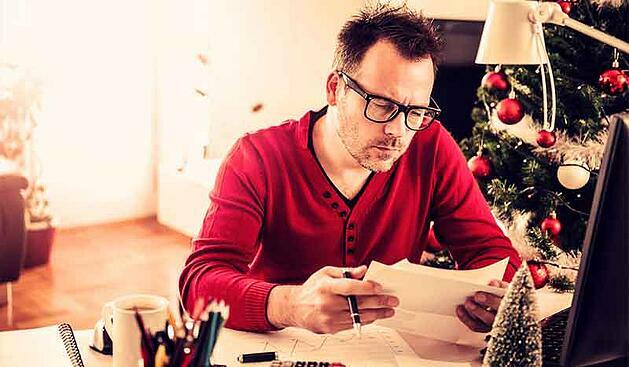 Although holiday surprises are usually fun, tax surprises usually are not. With any potential 1031 exchange, it is highly recommended that investors consult with their “deal team” early and often. Planning with your legal, tax, financial and real estate advisors prior to even selling your property could help to avoid any unwanted tax surprises. Planning may be even more important when there are potentially multiple tax years involved. Having multiple strategies or backup plans such as tax filing extensions, installment sales, structured sales or Delaware Statutory Trusts (DSTs) could make your exchange less stressful. In summary, if the above describes your situation, relax. Enjoy your gifts, visitors and treats this holiday season, without stressing over a 1031 Exchange failure or delay. Thanks to IRC 453, you could have a little breathing room. Do you have questions about IRC 453 or other aspects relating to a 1031 Exchange? Contact Realized Holdings for more information by calling 877-797-1031, or logging onto www.realized1031.com.